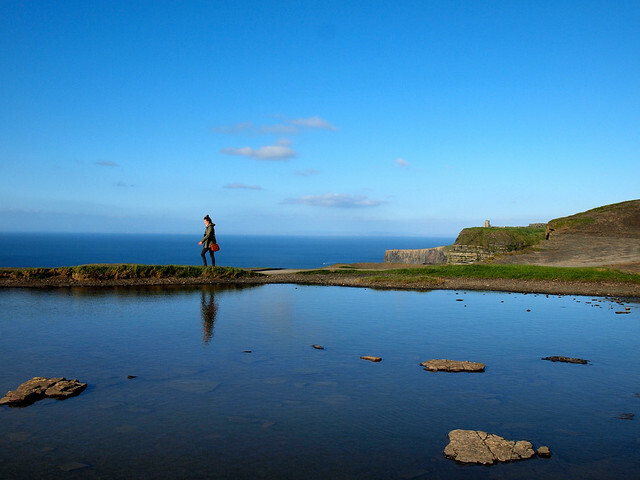 Each and every year, more than one million people visit the Cliffs of Moher in Ireland. Which is pretty impressive, when you realize that the population of this small, Atlantic island nation is only about 4.5 million. I guess it's a testament to these spectacular cliffs, which rise up more than 700 feet out of the sea on Ireland's west coast. I'd seen these cliffs before — in movies (like Harry Potter and the Princess Bride) and in plenty of photos. But actually seeing them in person? I was far more impressed than I thought I would be. The October morning of my journey to the Cliffs of Moher dawned chilly, but beautifully clear — a rarity for an autumn day in Ireland. I made my way to one of Paddywagon's pick-up spots in downtown Dublin, and happily climbed aboard a tour bus with a couple dozen others, all of us wiping the sleep out of our eyes. I vowed to stay awake, however — there was too much Irish countryside to enjoy. We set off from Dublin by 8 a.m., hitting the road for a long day of sightseeing. I was expecting to simply head straight to the Cliffs, but we had a couple of stops along the way: first Dún Guaire Castle and then the ruins of a monastery, followed by a stop in the town of Doolin for lunch. Then, finally, it was time to go to the Cliffs of Moher. Sleepy again and with a belly full of hearty soup, I sadly missed any commentary our Paddywagon guide offered up about the Cliffs on our way from Doolin. But it didn't matter. When Mother Nature creates something like this, you don't need to know a whole lot of background about it in order to appreciate it. 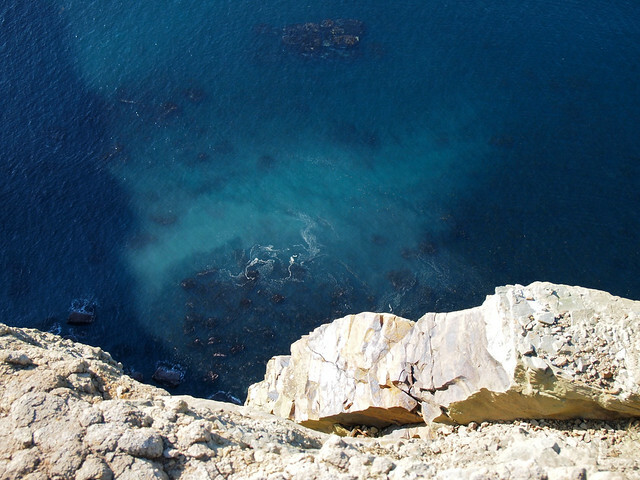 Upon arrival at the Cliffs, our guide set us free to explore for 90 minutes on our own. Could I have used more time at the Cliffs? Perhaps. 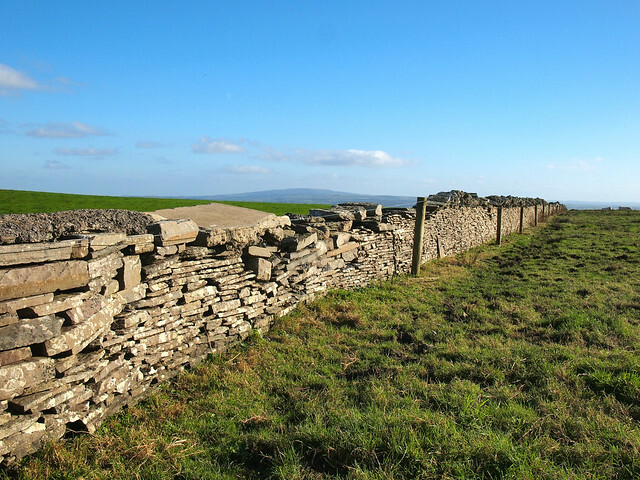 After all, the hike out to Hag's Head (the southernmost point of the Cliffs) takes about 3 hours round-trip, and there's also a visitor's center to explore. With a chilly wind blowing, however, an hour and a half suited me just fine. 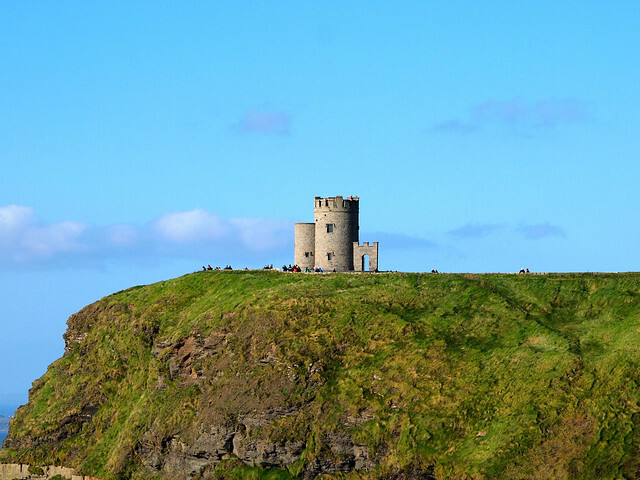 Most people made a beeline for O'Brien's Tower, the round stone tower that stands on the edge of the Cliffs. It's supposed to have some nice views. I, however, decided to go the opposite way, toward's the south. My reasoning for this was simple: since it was the afternoon by this point, walking this way along the Cliffs would provide the best light for photos. And I was well rewarded for my logic. Even though the Cliffs of Moher are one of Ireland's biggest tourist attractions, it didn't FEEL like I was sharing my views with lots of other people. In fact, most of my walk along the packed-dirt cliff trails was quiet. I left the Cliffs of Moher tired and more than a little windswept, but with a huge smile on my face. 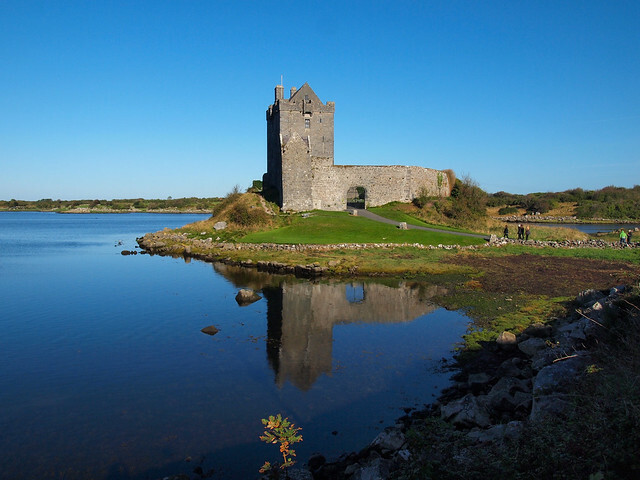 Though most people will tell you that the best way to explore Ireland is by renting a car and driving yourself around, there's a lot to be said of full-day trips like this one, too. Yes, you spend quite a bit of time on a bus, but you don't have to worry about navigating Ireland's narrow roads, and you can truly enjoy the scenery as it slips by (or, you know, you could take a nap). I went to the Cliffs of Moher with Paddywagon Tours, where a trip like this Cliffs of Moher day tour starts at 40 Euro ($62 USD). This price does not include lunch, but does include a guide, your transportation, and entrance to the Cliffs. 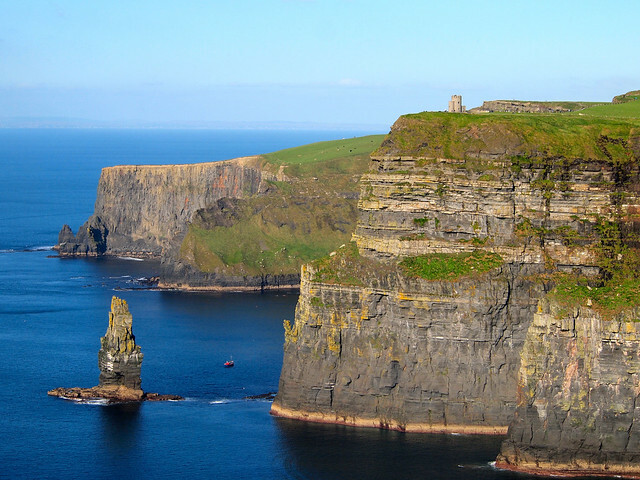 Alternatively, you can check out this Cliffs of Moher tour with Viator. 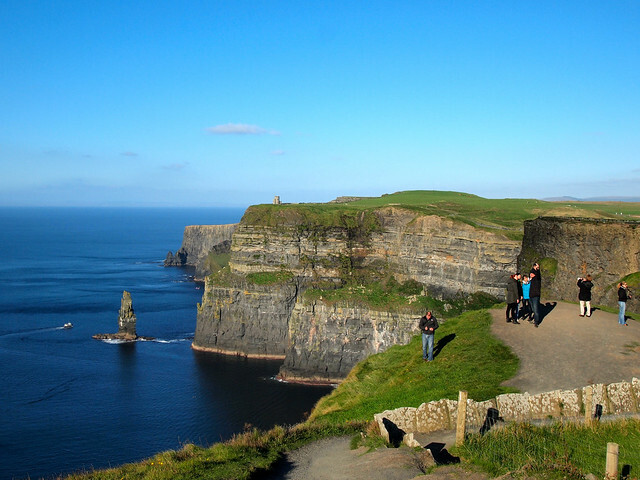 Are the Cliffs of Moher a place YOU would like to visit? 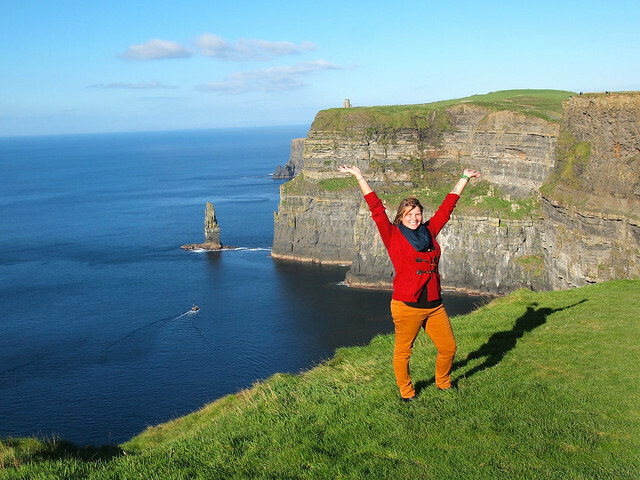 *Note: I was invited on a complimentary tour to the Cliffs of Moher with Paddywagon Tours. All opinions, as always, are entirely my own! To begin with, the pictures are simply outstanding! They are just so stunning! I loved the way you clicked them! I’d definitely like to visit Moher. Although I am not a big fan of guided tours, this one sounds nice. Thank you! They all came out really great – I still can’t believe the weather I had! Oh I love the Cliffs. I went about 2.5 years ago and the weather was terrible. Couldn’t see a thing. But I went back this year and had the most incredible day – I think even nicer than the day you were there. And I can vouch for Paddywagon too. I’ve done three trips with them. A great way to see Ireland. Good to hear you finally got to see them in good weather! I didn’t do any other trips with Paddywagon, but they sure offer some cool tours throughout Ireland! Wow great pictures! I also took a tour a few weeks ago from Limerick, and agree about the not having to drive part. My only issue with taking the tour is I did not get enough time to spend there. I think I could have used at least 3-4 hours because a lot of walking is needed to get around. Also the gift shop and audio visual tours. I had 75 min’s to pack it all in. This from a tour that started at 9:30am and got me back to to my hotel at 6:45pm. At the end of the day I’m so glad I went and will be coming back for sure! Yes, you could very easily spend hours there! I felt a bit rushed, too, but I really can’t complain – the weather was so perfect! I’ve seen many places like this in Ireland and Scotland, but not these actual cliffs. They must be famous for a reason! Oh, and puffins! I was unlucky a few years ago. During a trip to the Orkney islands we were supposed to see some, but on that particular day we weren’t able to see any! Bummer! I want to go to Scotland or Iceland in the summer sometime to try and see puffins! What beautifully captured images. 🙂 Ireland is definitely a place I would love to visit someday! 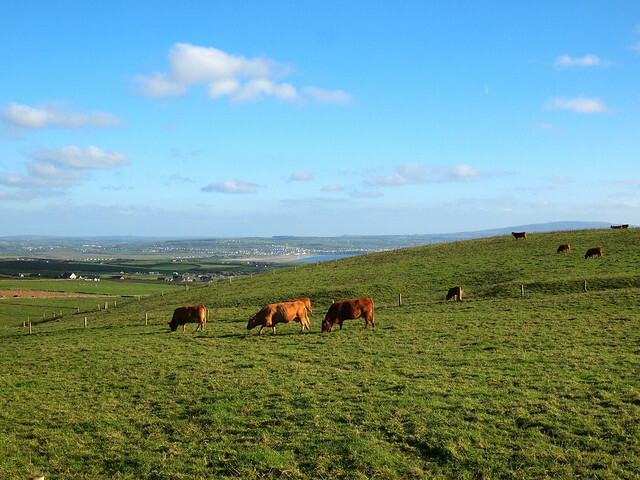 Ireland is gorgeous – one of those must-visit places, for sure! nicely photographed! 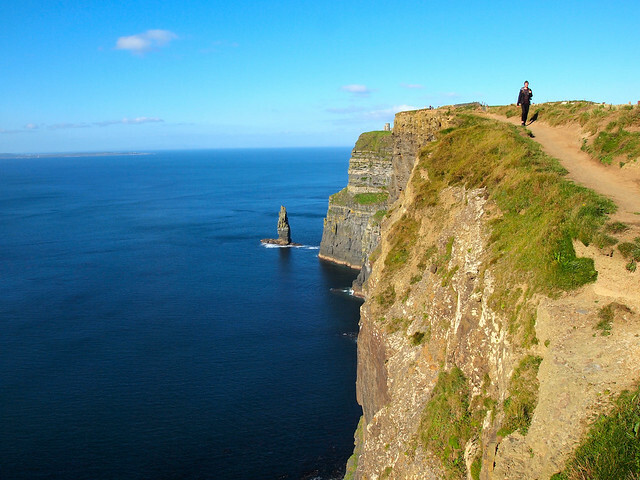 I’ve been to Dublin 4-5 times now but haven’t found the time to get out to the Cliffs of Moher…yet. I’ve wanted to see them for years. Thanks for the visual tour! Just finished visiting Dublin, Doolin (the cliffs) and Blarney. Dublin pailed in comparison to the rest of our travels. Doodling is also known for their trad music. Not like what you hear in Dublin, but much better! Go for sure. We certainly want to return. I was in Doolin briefly, and agree that is was lovely! I also really loved Dingle! Absolutely gorgeous–you’ve made me put this on my travel wish-list. And what beautiful weather you had! Whoo hoo! Hopefully you’ll be able to cross it off your list someday, too! Loved the pics Amanda!..Definitely on my bucket list. It think Cliff Of Moher is one of the most beautiful cliffs I’ve ever seen. I just can’t remember which movie I saw this cliff.I love your photos. They are all stunning. They have been in quite a few movies! If you’ve seen The Princess Bride, they star as the Cliffs of Insanity! Beautiful photos. I NEVER knew that this was the filming location for the Cliffs of Insanity! Inconceivable! These photos are stunning! Ireland was amazing. So much beauty and so much more to explore. I need to go back to go here! Thanks, Helen! Even though I’ve been to Ireland twice, I have a feeling this trip won’t be my last! I realllllly lucked out with the weather! I wish I had the experience you had with the great weather. I did not enjoy it as much, but it is definitely worth the trip if you are in the area. I got SO lucky with the weather! I’m not sure if I would have enjoyed it as much as in the rain, to be honest. I took a three day Shamrockers tour along the coast (which I loved) and this was of course one of my favorite stops. Beautiful photos! Ah yes I could see that being a highlight! That shot over the cliff into the water makes it seem like you’re right on the edge. Eeeek! 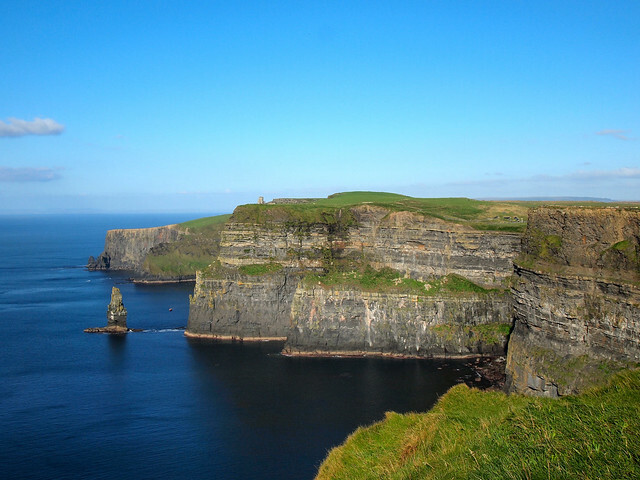 I wish I had planned a trip out to see the cliffs when I was in Ireland as they’re gorgeous! Heehee, well I kind of WAS very near to the edge to get that shot! Lucky I’m not afraid of heights! Great photos. Good that other people will know about the spectacular cliffs. Looks like you got a good day at least as in the last 2 weeks with the storms the spray from below is coming over the cliffs! 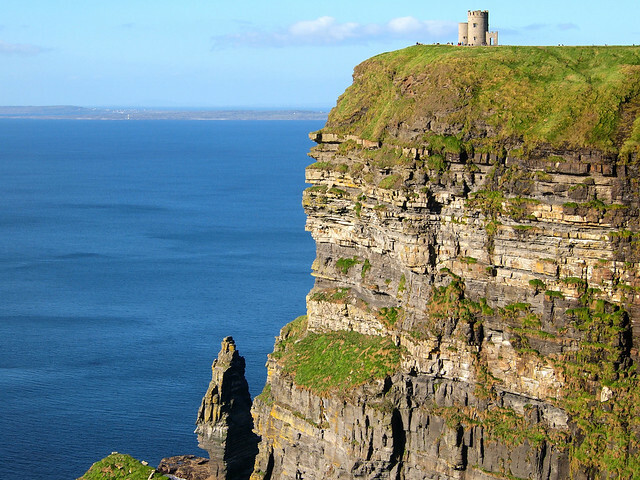 The Cliffs should definitely go on any Ireland bucket list! I love The Burren, where the Cliffs are. The first time I went there, it was before the Visitors Center and was way less crowded than it gets these days. 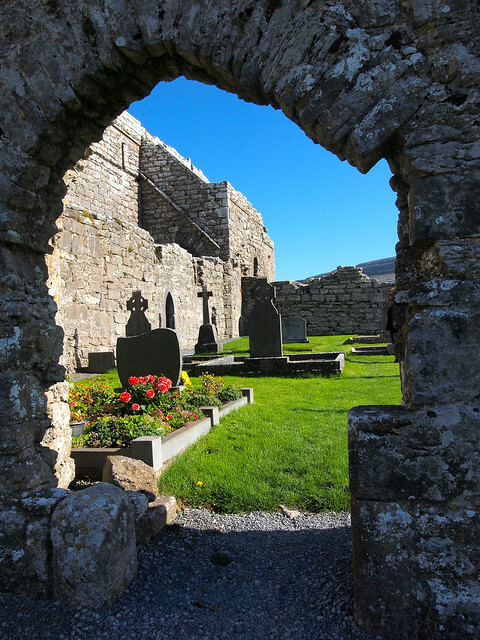 Doolin is know for its traditional Irish music and the entire area has archeological and other treasures. A wonderful place to go when in Ireland. Spend a few days! The Burren was indeed incredible! WOW! You got some great photos of the cliffs! Really hope you have enjoyed your trips to Ireland as much as we have enjoyed your posts! Thanks! And yes, I love traveling in Ireland!! My goodness what beautiful images! I loved them all. Thank you! The Cliffs are really stunning! Thanks so much, Eden! 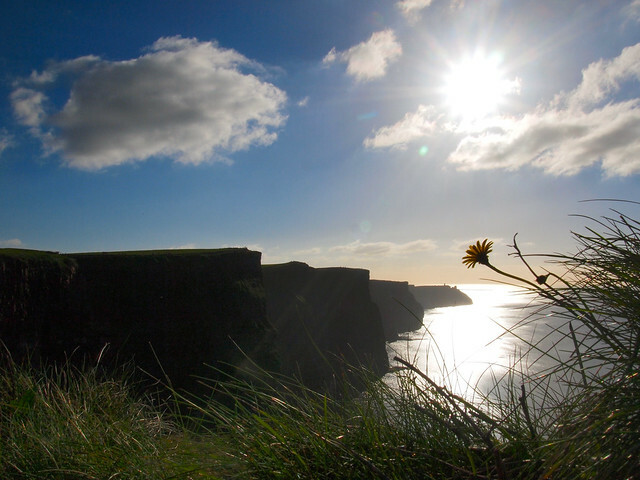 There’s definitely a reason that the Cliffs of Moher are so popular! I envy your photos, not only because of the quality but because we went to the cliffs on a cold, windy and rainy day in May. I wanted so badly to shoot some nice photos and ended up with a lot of grays and dark clouds. That path along the edge of the cliffs was memorable — the high winds almost seemed like they were ready to knock some of us off the cliffs and into the water below. I definitely lucked out with the weather the day I went (though it was still very windy!). I’ve just returned from a trip to Ireland. I had no idea the Cliffs of Moher were a must-see. Looking at your photos, I realize I have to get back there at least once more. Thanks for sharing your beautiful pictures! 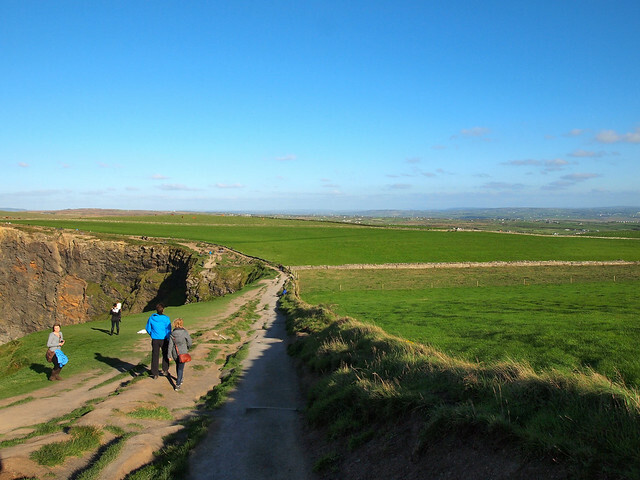 I totally agree with you day tours are a very good solution for those who want to visit Ireland without worrying of driving and you can enjoy the Irish countryside as well and the cliffs are just wonderful ! Hope to welcome you back in Ireland soon. I am about five years late to the party :-), but these photos are wonderful. 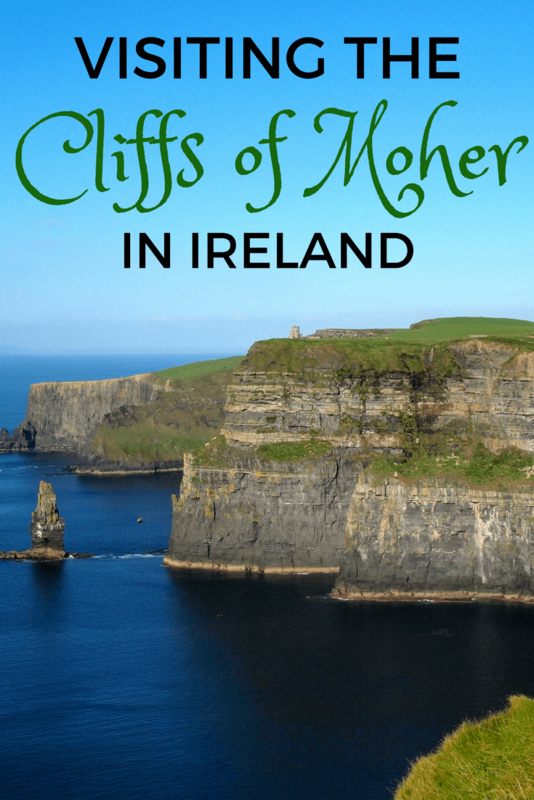 Our family just returned from a visit to Ireland and we included the Cliffs of Moher. it was a rainy and foggy day, but we still got some awesome photos, and some kind of eerie ones, too. For those who like this sort of thing, be sure to visit one or more of the following: Cliffs of Moher, Cliffs of Kerry, Slieve League, or the cliffs around Dunluce Castle (in Northern Ireland). I’ve visited the Cliffs of Moher three times now, in 3 different types of weather – and they’re pretty much awesome no matter how you see them!